Imbalances of the urinary tract are widespread, and it is estimated that 20 percent of women will experience them. 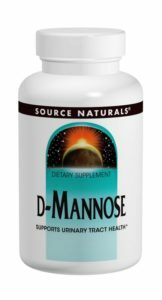 Source Naturals D-Mannose supports the health of the entire urinary tract: the urethra, bladder, ureter, renal pelvis, and the renal parenchyma. D-Mannose is a monosaccharide hexose sugar, naturally found in some trees, berries, and fruits, such as cranberry. It complements the body’s natural cleansing process. Allergies: Contains no yeast, dairy, egg, gluten, soy or wheat. Contains no starch, salt, preservatives, or artificial color, flavor or fragrance.